Is the Drought Over in Ocean Beach? No drought in OB – corner of Sunset Cliffs and Narragansett. All photos by Judi Curry. So, is the drought over in OB? If you have driven down Sunset Cliffs Boulevard in the past three months you would sure think so. I stopped driving down this street months ago when there was construction going on and I had to take detours. Guess what? There is still construction going on and the street is like a floating river. Because parking is at a premium I parked in the Olive Tree parking lot since I knew I had to purchase some items there later. Walking across the street from the west side of Narragansett to the east side I had to step in water that was running over the curb. (In fact, the reason I was even on Narragansett today was because I had an appointment with Mary from Mary’s Therapies for a massage. Imagine my surprise when I walked in to find her foot bandaged and she was limping. She told me she was riding her scooter down Sunset Cliffs and hit some rocks with the front wheel of her scooter. She fell off the scooter and injured her foot. I asked her where the rocks were from and she said that they had been swept into the street from the flow of water that was cascading down Sunset Cliffs. 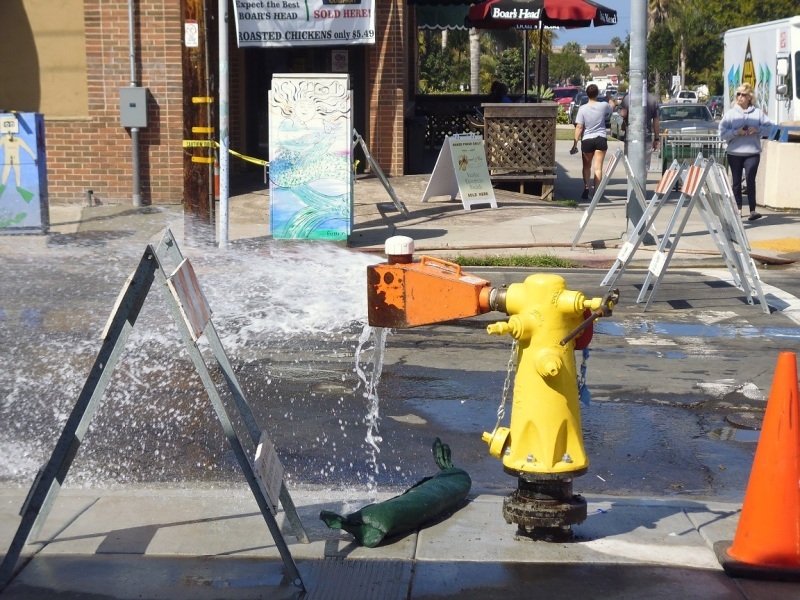 I was amazed at the amount of water that was emanating from the fire hydrant on the east side of Sunset Cliffs and knew that after my massage I would stop in at several of the businesses along the way and talk to them about the construction. Suffice it to say that the merchants along the area are not very happy. The amount of business that some have lost is enormous. According to all of the people I talked to this has been going on for over three months. 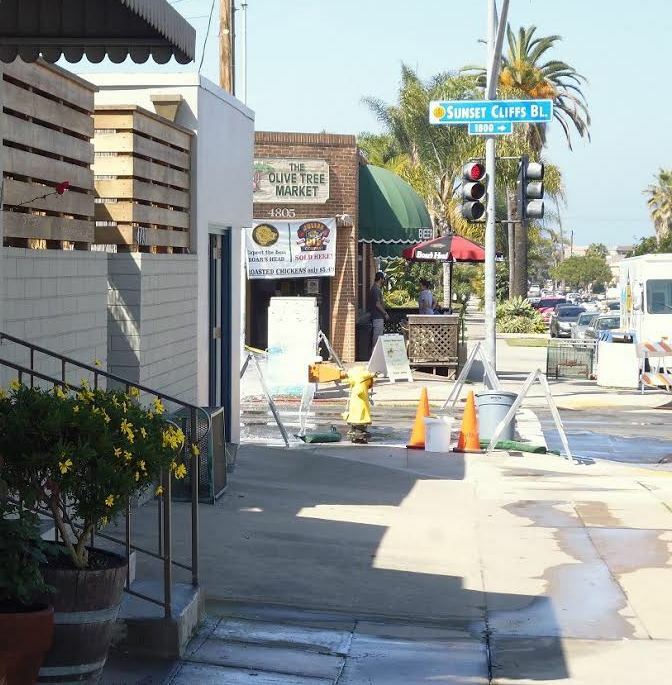 I think it has been going on much longer than that because I remember trying to park my car last year on Sunset Cliffs in front of the Victory Liquor store only to find that exposed pipes were evident on the outside of the curb. That meant I could not pull up to the curb the way I legally should have, and was, in fact, into Sunset Cliffs more than was safe. They will be flushing out the pipes again very soon. I asked him what it would take to save the water that was making Sunset Cliffs a river and he said the City would have to send out a truck; have the water loaded onto the water truck and then carted away to someplace where the water could be used. This would be time consuming and expensive. Really? My fruit trees, grass, plants are dying because I was told we were in a drought and we needed to conserve our water. There are gallons and gallons and gallons of water running down the street. Who is paying for that? You and me is the answer. Gabriel said he was a tax payer and wasn’t very happy about it either. A worker at the Olive Tree Market told me he arrived at work at 7:00am and the water was already gushing down the street. I was there at 12:00pm and it was still gushing – and would be gushing until it was time for the workmen to leave tonight. And then it will start again tomorrow. And here is another rub: SDG&E is now about ready to dig up the street again so that they can lay the electric wires underground. 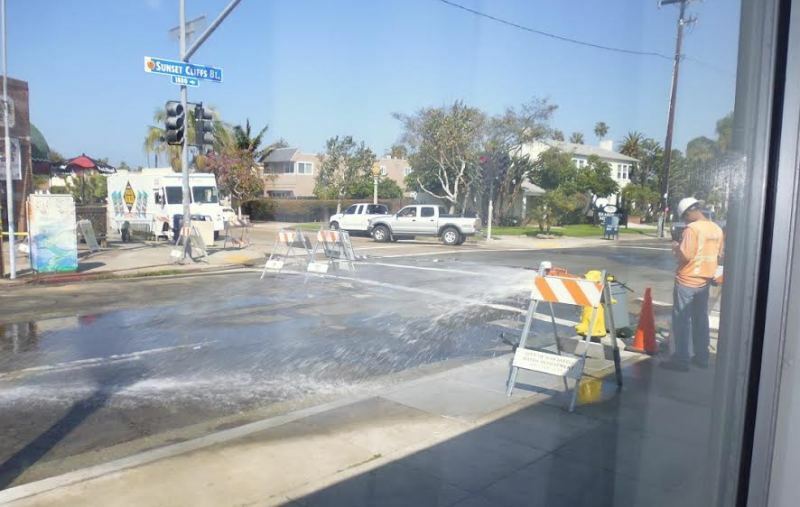 What I have never been able to understand – yes, I was a blond in an earlier life – is if the ground is open for the new water pipes, why does it have to be closed and then reopened for SDG&E. Why can’t the trenches be left open so that there is less dirt, more productivity and less monies spent in completing the work. These are electric lines being placed underground. Will these trenches be filled up only to be reopened so that gas lines will be able to be placed underground? And the erosion! The streets all along this area are in disrepair. Why? Because as streets are closed off and more “detours” appear, work is being done on those streets that are also causing pot holes, loose rocks and uneven pavement. What’s that you say? The drought isn’t over? Are you sure? Ocean Beach still has to ration its water? Then please let the City know. It appears no one told them. Get those frigging water trucks over her and save the water. My water bills are enormous. Why? If the City can let it run down the street, surely I should be able to water my plants. I know this project has been going on for quite some time. I was there this morning when I saw the water gushing out like crazy. I normally park in that area, but lately I have been avoiding that area big time & I don’t want to deal with the morning traffic congestion as well. Even when the work crew are done for the day, I don’t even drive on Sunset Cliffs for now because the roads are just bumpy & horrible. I lived on Lamont street in PB for a year, they were doing a similar project there and it took WAAAY less time. When I lived there, at least 5 times my water shut off due to the above ground pipes separating and having water spew everywhere. I then moved to Orchard and Ebers and had the same issue there a few times. We’re in a drought and yet we have open pipes spewing water all over, its insane. Humans are the craziest mongeys. Check out and “like” Save Water OB on Facebook. This project has been going on more than 3 years. All it seems to accomplish is keeping the contractors and subcontractors employed. Our friend Mr. Faulconer didn’t seem to care when contacted. And the street is about ready to be torn up again! One of the merchants told me that she thought that now that Faulconer is the mayor things would change. I looked at her incredulously and trouble keeping my mouth shut. I pointed out that he was our representative and he didn’t do anything so far. Newer Article: Not one drop of water for fracking in California!